"Ever wondered who defied death to build these roads? BRO that leads the way." Sikkim is a former Buddhist kingdom nestled along the Himalaya, bordered to the west by Nepal, the north by Tibet, and the east by Bhutan and China. About 30 years ago, India took the reigns, yet its unique identity is still reflected throughout the state. Narrow, winding roads are etched into the sides of steep mountains prone to landslides. Despite the dangerous conditions, the roads are paved and often surprisingly smooth. The Border Roads Organization (BRO) take immense pride in these results and there are street signs throughout the state which praise the laborers and also caution people against driving dangerously. 4×4's are the primary form of transport. I took two jeep tours – the first a day trip, and the second a 3-day journey into the northern reaches of the state. Sikkim is also home to the world's 3rd tallest mountain, Mt. Kanchenjunga, which I was able to catch glimpses of from Gangtok. That sure is a lot of content about a place I hadn't heard of. I've got some reading to do. Sounds intriguing, Dave. Thanks! Did you run in to any aclimatization issues up there in the Himylayas? Nepal is not the easiest country to get to because there are no direct flights from the West (that I know of) but it's soooo worth it. Would love to see more pics of the roads if you got any? I have tons of photos, however for now, I'm just going to share the link to my Flickr photoset. great articles. 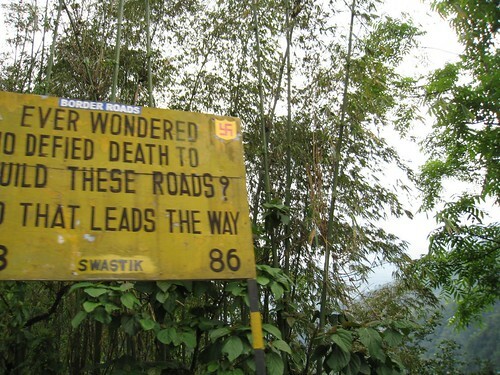 i remember these signs when i was heading up to the town of Yuksom…. 16 people squeezed into a jeep going along not so wide roads! Was incredible though, particularly driving along the main river sitting in the back seat with 5 others! Sikkim is truly incredible and I hope to go back there someday – found an awesome little guesthouse up at one pagoda, no signs, no marketing, pure word of mouth! Yes, I loved those signs. I wanted to keep a list of all the phrases and warnings, and then print up t-shirts with them, but didn't want to keep asking our jeep driver to slow down. We hired a guide and our own jeep so it wasn't as crowded as yours. Another nice article! well people should really thanked those he roads. I need to visit the place also and of course i need again LMT to find me a good hotel with a good price where i can stay while having a vacation there..
You mentioned that you can pass on narrow winding roads so it means the road is dangerous. Drivers should be very careful in driving because of the condition of the road. I was there in Jan this year..the roads are a lot more worse now..BRO is building 4-lane roads..so loads of cutting n digging…our driver drove as if he was on some express way..was scary but fun…You should have gone up till Nathula pass..its breathtaking up there at 14140ft…!